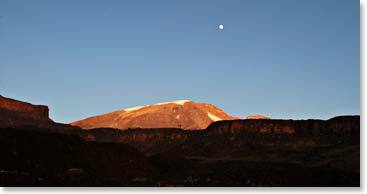 Join us as our team climbs the north side of Kilimanjaro on the beautiful Rongai Route. On Summit day we awake in the middle of the night and climb through the starlit upper reaches of Kilimanjaro that will seem endless. We will reach the summit via the Hans Myer Cave and Gilman Point. After climbing the outstanding mountain of Kilimanjaro, our team will head on to a safari for six days through the vast landscapes of the Serengeti. Stay tuned! September 5, 2008 – Our Amazing Trip Comes to an End! August 30, 2008 – Summit Success! August 29, 2008 – Heading Up for Summit! August 27, 2008 – Doing Wonderful at Kielewa Cave Camp!